Shia LaBeouf fires a mean backhand as John McEnroe in Borg/McEnroe. With his curly hair and rebellious star persona, he's surprisingly well cast as the bad boy tennis star who faced off against beloved reigning world champion Bjorn Borg (Sverrir Gudnason) at Wimbledon’s 1980 Championship game. Labeouf also shares a facet of McEnroe's character that really adds to the dynamic of this engaging and compelling tennis drama: no matter how hard he tries or how much he proves himself, he's not an easy guy to like. Yes, Cinemablographer punching bag Shia LaBeef just can’t get a break and that’s what makes Borg/McEnroe so watchable. One creates love/late relationships with stars and celebrities based on how one perceives them. In my mind, LaBeef is a hack actor who uses his reluctant stardom for shameless self-promotion. He keeps beating this dead horse with gimmicks like wearing a paper bag over his head, crying and playing Marina Abramovic, and insisting that he isn’t famous anymore while dappling in increasingly more challenging art films. He’s as annoying as Justin Bieber and just can't change my opinion of him.. But the LaBeef or Biebs of the day, at least when it comes to sports, was bad boy McEnroe. The actor inhabits his character with vivid restlessness, assuming a rugged charm as McEnroe riles up the competition with his bad boy antics and notorious temper tantrums on the court. McEnroe’s desire for adoration resonates strongly with LaBeouf’s tenuous relationship with stardom. He finds a worthy rival in Gudnason, who’s relatively unknown on this side of the pond despite success in his native Sweden, as the respectable and respected Borg. While LaBeouf’s McEnroe is purposefully annoying, Gudnason’s Borg is a class act. The OCD Borg strives for perfection to fanatical degrees and is a strong foil for McEnroe on every level as he offers a star that fans adore and the establishment loves. Director Janus Metz lets the action fly as the drama lobs from back and forth across the court in this battle of icons. While it’s not one of the flashier films to open TIFF in recent years, Borg/McEnroe improves upon recent openers like The Judge or The Magnificent Seven by kicking off the fest with an engaging tale of rivals in which one sees both sides. (I also really like watching the film as a metaphor for the ongoing match between TIFF and Telluride, but that’s another article.) Paced briskly by editors Per Sandholt and Per K. Kirkegaard, Borg/McEnroe moves swiftly and suspensefully through the Wimbledon games and develops the backstories of both players as it builds to the inevitable grudge match. 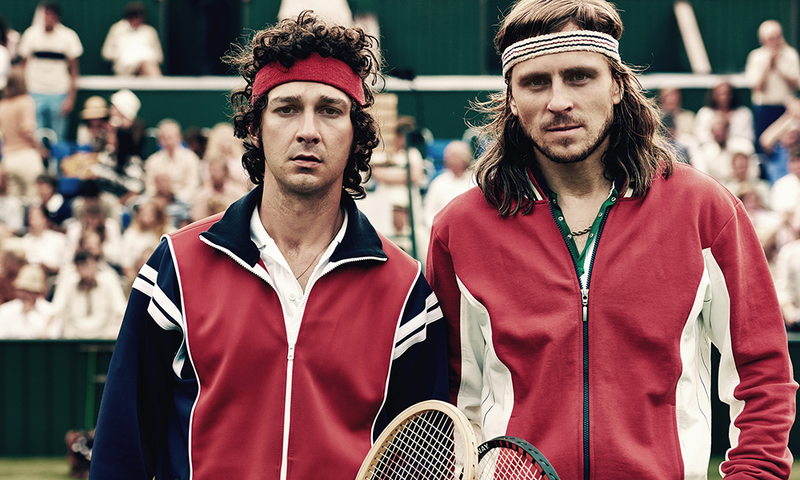 Even if one knows the outcome, Borg/McEnroe is riveting drama.